During the 1970’s, George Lucas and Steven Spielberg laid the groundwork for what we now call the summer blockbuster. Jaws and Star Wars provided Hollywood with a lucrative new template that would increase their box office and merchandising revenues exponentially. While that monumental feat was more than enough to establish each man as a wunderkind in his own right, they both still had one more amazing trick up their sleeves. They both drew on childhood obsessions to fuel their creativity, and had now decided to combine their efforts. The offspring of this collaboration would be birthed on June 12th, 1981. Action/Adventure films haven’t been the same since. Raiders of the lost Ark was largely conceived during a 1977 Maui vacation in which Lucas conferred with friend and colleague Steven Spielberg. Both were taking a sabbatical from the stateside excitement surrounding their current projects at the time. Spielberg voiced interest in helming a James Bond film. Lucas then shared with him an idea he concocted in 1973, about an adventurer named Indiana Smith. The idea took it’s inspiration from the adventure serials of the 1930’s. Spielberg liked it, with one reservation: The name Smith needed to be changed. Lucas suggested Jones, the name of his Alaskan malamute. 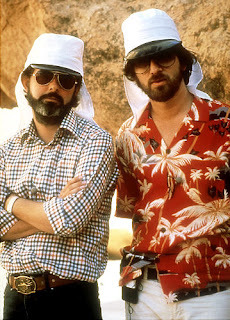 Writer/Producer George Lucas and director Steven Spielberg. Over five days in January of 1978, Lucas, Spielberg and screenwriter Lawrence Kasden conducted brainstorming sessions in a hotel room. The conversations that resulted were fashioned into a first draft of the screenplay. Many ideas were excised, as some were deemed out of character for the grand adventure that Lucas had in mind. 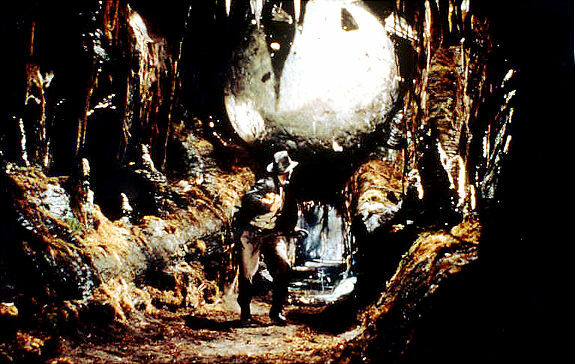 The story focused on Indiana Jones, whose services are requested at the behest of the U.S. government to help fight the Nazis during World War II. Hitler has become determined to unearth the Ark of the Covenant, and has spared no expense to do so. Indy is dispatched to procure and deliver the Ark to the “good guys” so that it does not fall into Nazi hands. Despite the considerable pedigree of its makers, the film was rejected by every studio save for Paramount. Harrison Ford was awarded the role of Indiana, which almost went to Tom Selleck. Karen Allen won the role of Indy’s love interest Marion Ravenwood. Paul Freeman would play his fellow archeologist and antagonist Rene Belloq. The film was made in a similar fashion to the serials that inspired it. Heavy storyboarding and a cost effective shooting schedule ensured a tight production. Lucas wanted this film to be lean and mean. Indy being chased by a boulder after retrieving a fertility Idol from a sacred temple. Being that it was inspired by adventure serials; the film contained a number of thrilling set pieces. These sequences escalated in scope and audacity as the film progressed. There is an expedition to retrieve a fertility idol from an ancient temple, a shootout/bar brawl in Nepal, and an elaborate car chase through Cairo. All of this was achieved the old fashioned way, with practical effects and actual stunt work. Industrial Light & Magic provide the necessary matte paintings, blue screen work and models to make the illusion complete. Guiding it all was the sure hand of Spielberg himself. He proved himself peerless at crafting spectacle, but also nimble at incorporating genuine moments of sheer horror. A much darker sensibility lurks just beneath the surface of Raiders, from the spattering of blood on a planes tail fin to exploding heads and melting faces. Spielberg allowed his id to come out and play every, though he kept it on a tight leash. Even the hero himself was not without a dark side. Indy was not only atheist/agnostic, but had a taste for teenage girls. Still, none of these rough edges detracted from the fun and excitement. Spielberg had proven himself to be the consummate cinematic alchemist. Director Steven Spielberg hard at work. 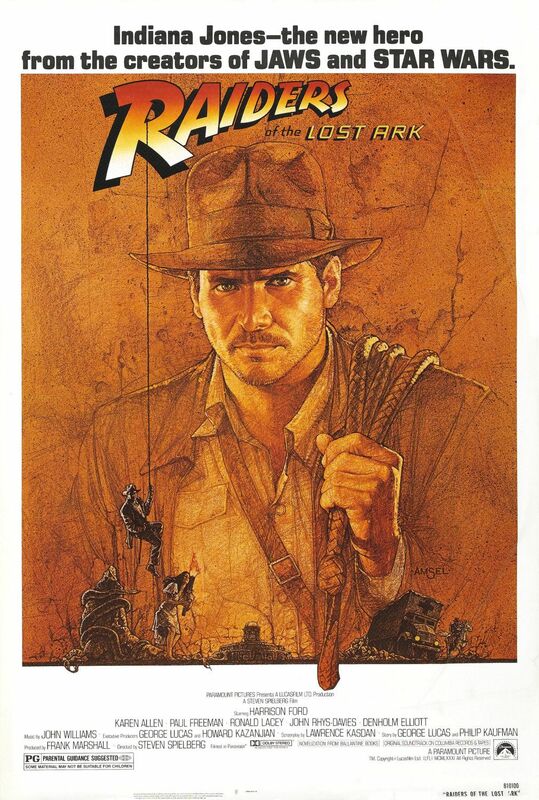 Raiders of the Lost Ark went on to gross 384 million worldwide on a budget of 18 million dollars. It was nominated for 9 Academy Awards, including best picture and best director. It spawned three sequels and a television series. It was a certified phenomenon, further cementing Lucas and Spielberg’s reputation as premier cinematic mythmakers. 30 years later, it is still regarded as perhaps the finest action/adventure film ever crafted. 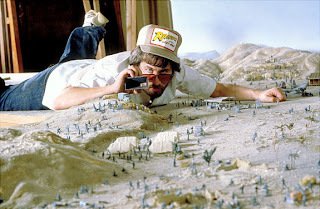 Many films have attempted to achieve the delicate balance of Raiders, often severely over or undershooting the mark. Perfectly paced, shot, and conceived, Raiders is one of the most perfect films ever made. Happy Birthday, Henry Jones Junior. I tip my Fedora to you.